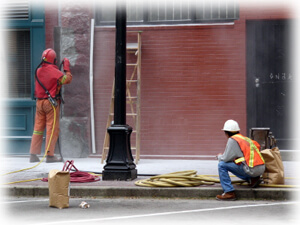 Paint Removal using a pressure washer and/or sand blaster configuration and combination of either light, medium and heavy speciality equipment, can prove to be highly effective and lucrative, cost-effective and a time-and-money saver. It is applicable and appropriate for a variety of tasks and projects in and around your house, business, property and structures. Pressure washers and sand blasting equipment, will save you time and money, particularly on large projects and remodeling of scale. Whether you are doing deck, wall or other painted surface, paint removal, priming and cleaning will never be easier. With this speciality equipment at your disposal, high-pressure, blasting tools can let you do way more than you could by hand. Paint removal at any given point in time, is no joke. It requires persistence and effort, elbow-grease and hours of labor, no doubt about it. Now, paint removal using pressure washer and sand blaster is reliable, affordable and within your easy reach. We source and supply solutions and answers to any paint removal challenge. Rotating or rotary nozzles just enables you to do so much more. Ordinary pressure turns into powerful scrubbing power using a propelling jet stream of rotating water to blast through even layers of paint! Chores of this nature become a breeze as pressure washer and/or sand-blasting equipment enable cleaning processes and projects that involve large, flat surfaces with relative ease and powerful effectiveness. High-speed rotation makes it possible to let you make progress with the job quickly and clear/clear a wide area in a relative short period of time. To remove paint from surfaces nothing beats the speed and thoroughness of a pressure washer and sand blaster. Paint removal can be an arduous task by hand, especially if you need to remove paint from large surfaces such as industrial buildings, graffiti from bridges and large walls, or other surfaces. That is why using a pressure washer, sand blaster combo is so economical. It saves time and in the long run money. Here are a few things you should know before you begin. Paint removal with a heat gun, scraping or by hand is immensely time-consuming, and chemical removers are pungent and takes equally as long to work well, with some projects even requiring some additional application or more work to get to a point where you are ready to prime and paint. Pick the right pressure washer and sand blasting equipment for the nature and scope of your project. Protect yourself and the surrounding areas that you are not working on from damage or injury. You would not want flying particles to go everywhere it should not. Windows and glass surfaces should also be protected and covered. Flyaway sand and paint can corrode, even break glass and other surfaces. There is a variety of materials you can use for this purpose including tarps, plastic sheeting, oil paper, and water resistant tape. Ensure that you have the proper nozzles, gauges, hoses, and sand type for your type of job, project or task at hand. Prepare and ready your equipment. Adjust and test the pressure washer/sand blasting tools, do a dry run to ensure efficient, smooth and functional operation. In addition, test the water speed, sand flow, angle and distance set a piece of metal or object similar to what you will remove the paint from and stand at a reasonable distance from it. Adjust the water speed and sand flow according to the removal, and then sample different angles and distances until you get the desired result for your project. Every step involved in the process, including the clean up, has never been quite this easy.